Dermatologists recommend coming in annually for a once-over to check for skin cancer. It's quick, painless and can pick up on early signs of trouble when the disease is most treatable. WASHINGTON — It’s the one body check you should all do, but far too many people don’t get regular skin cancer screenings. Dermatologists recommend coming in annually for a once-over. It is quick, painless and can pick up on early signs of trouble when the disease is most treatable. But there is also a self-help side. “It is not enough to come in once a year. 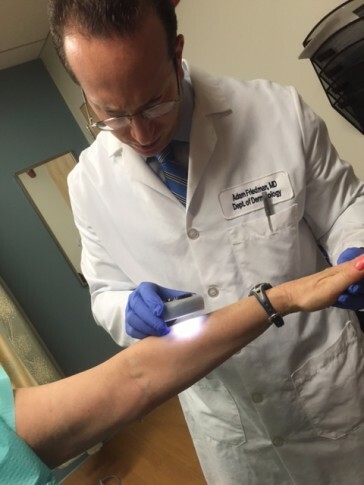 You need to check yourself out at least once a month,” said Dr. Adam Friedman, who teaches dermatology at the George Washington University School of Medicine and Health Science. It is a simpler at-home version of the screening done in the doctor’s office. Friedman says the key is to look for change. “You are looking for changes over time: whether a spot is getting bigger or smaller, getting more color or losing color, changing texture and of course, how does it feel — does it hurt or burn,” he said. Experts say the best time to check your skin is after a shower or bath. Have a full-length mirror, and a smaller hand-held one, and make sure there is plenty of light. You want to check yourself from head to toe starting with the face, neck, ears and scalp. Check the front and back of your body in the mirror, and then raise your arms to screen your right and left sides. Then move to your arms, a prime spot for skin cancer to turn up, and go from your shoulders down to your fingernails. Do the same thing with your legs and finish up with your feet. It shouldn’t take long. A screening in a doctor’s office takes five minutes or so, plus any extra time you might need to fill out a family history report. And when it comes to family, it’s important to remember that skin cancer happens at all ages. While the elderly have extra factors that can increase their risk — like certain medications that can make someone more sensitive to the sun — kids can get skin cancer too. Skin cancer is the most common type of cancer diagnosed in the U.S. Every year, more than a million Americans learn they have it. If diagnosed very early, it is extremely treatable and the survival rate — even for melanoma, the deadliest form of skin cancer — approaches 100 percent.